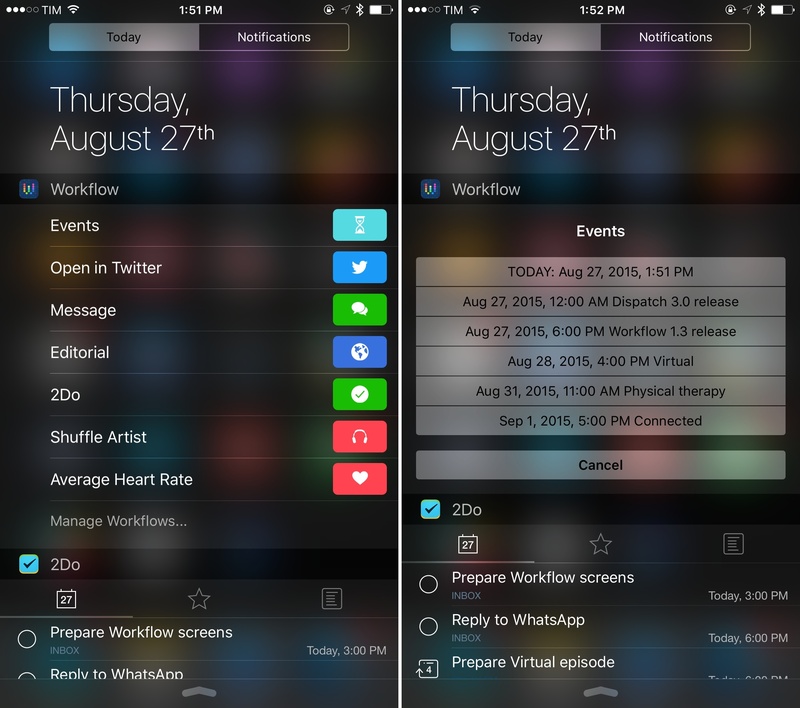 When I first started testing Workflow in the summer of 2014, the app included a Today widget that allowed workflows to be launched directly from Notification Center on iOS 8. It was a handy addition to the app, and if you take a look at my story on iOS 8 from last year, you'll see some screenshots of the original widget. That widget, however, couldn't be released on the App Store: that was when Apple was unsure about the functionality of widgets as app launchers, and the Workflow team decided to put the feature on the shelf until they'd be sure Apple's policies could allow the functionality they had in mind. The widget that is launching today with Workflow 1.3 is considerably more powerful than the beta version I first tried over a year ago, and it shows how the extra time has enabled the team to make the widget fully interactive and more capable. On the surface, the Workflow widget is a list of workflows configured to be launched from Notification Center. In the app, a new Today Widget type is available in the Settings screen of each workflow, and activating it will let you tap the workflow's name in the widget to launch it. If a workflow involves launching another app such as, for instance, opening a webpage in Safari, the widget will go directly to that app without going through Workflow first. For users who keep several launcher-type actions in Workflow, the widget will be the fastest way to access those launchers: because Notification Center can be shown anywhere on iOS, your workflows can always be just one tap away. Even at this basic level, the Workflow widget reduces the time you'd otherwise spend bringing up a share sheet for the Workflow extension or going back to the Home screen to launch the app. The biggest surprise of the Workflow widget, though, lies under the hood. 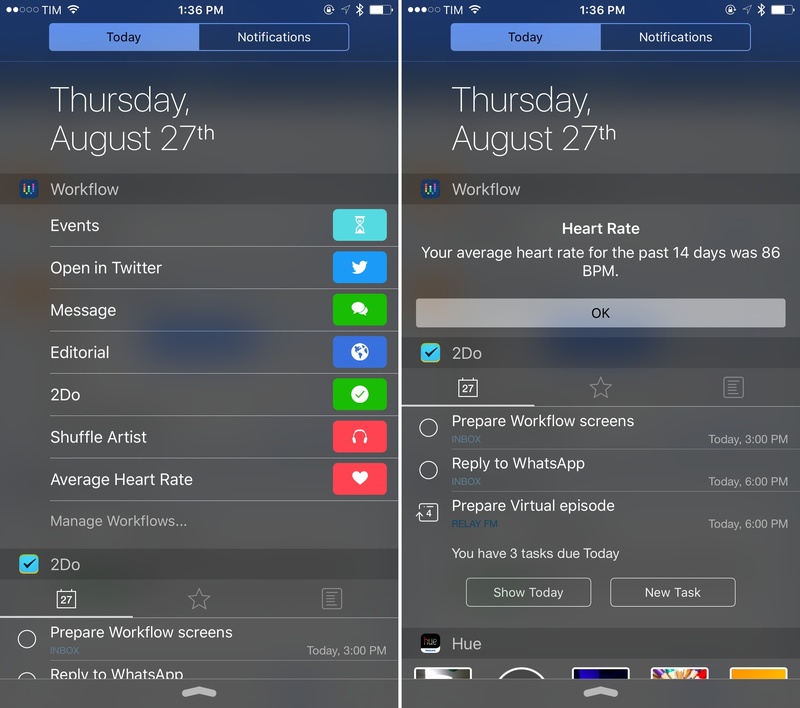 The app's widget can execute workflows directly inside Notification Center without having to open the app. This means that, in most cases, you'll be able to fully execute a workflow – and receive UI feedback – in the Today view, with support for touch interactions. To make this possible, the Workflow team had to be judicious in terms of memory allocated to widgets in iOS 8. Some of the more advanced and memory-intensive workflows will require you to open the full app to finish them; on the iPhone 6, you'll be limited to keeping up to 12 workflows in the widget (there's a new screen in the app to configure and reorder workflows you want to see in there). For the most part, workflows that display basic interfaces (such as lists and prompts) or that don't display UIs at all will be completely executable from Notification Center – effectively bringing the power of Workflow to the Today view, which is unprecedented for widgets of this type on iOS. We can go deeper than that, obviously. With this workflow, I normally open a twitter.com URL in Twitterrific or the Twitter app by showing the Workflow extension for that link. The same workflow modified to work as a widget can show a Twitterrific/Twitter prompt in Notification Center to quickly open a copied tweet in a different app. The same concept applies to nested prompts and lists: I have a workflow that asks me if I want to share some arbitrary text or the contents of the clipboard with a contact. Typically, this is a full prompt in the Workflow app; in the widget, it becomes a simple list with buttons I can tap to initiate a conversation with pre-composed text. Whenever typing text or picking an image is required in a workflow, the widget will have to open the app because those tasks can't be performed in Notification Center (an iOS limitation). But for pre-composed menus and lists or clipboard contents2, the Workflow widget will be able to carry on those actions independently – a huge step up from launcher widgets that are limited to shortcuts to other apps in the Today view. Thanks to the Workflow widget and its deep functionality, I've been able to put together actions that help me get things done faster on a daily basis. With this workflow, I can send a URL to the Editorial browser without going through the share sheet first. In another 2Do-based workflow, I can save a copied link as a task in the app and tag it with "MacStories" or "Virtual" depending on what it's meant for, with 2Do setting a browse action on the task thanks to Workflow's superior integration in version 1.3. And perhaps even more impressively, I've created a Workflow widget that displays my next calendar events with date, time, and title of the event in a list I can show and cancel at any time and that doesn't take up too much space all the time. 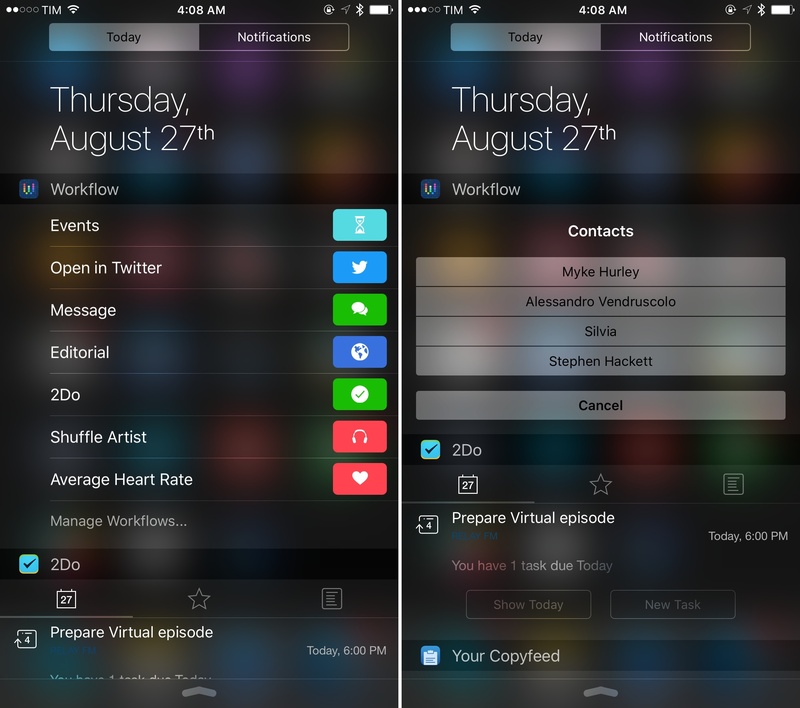 Workflow's new widget is another example of how iOS limitations can breed creativity in developers and users. The Workflow team considered the constraints of widgets to build time-saving features that are lightweight and suited for the quick interactions of the Today view. As a user, you'll likely find yourself rethinking how workflows can be adapted to widgets for faster access, experimenting with the app's lists and custom UIs to get creative in how you can be faster at working on iOS. More than a series of shortcuts with deep app integration, the Workflow widget is a fantastic new playground for the app. This feature is going to be well received by users of Workflow who've struggled to keep the same workflows on multiple devices. Workflow 1.3 introduces Workflow Sync, an online account to keep your workflows (and, optionally, your workflow order) backed up in the cloud and synced between devices. Workflow Sync has been working well in my tests and I like how the login screen offers 1Password integration for quick sign in. Sync happens automatically, usually taking a couple of seconds to make an edited workflow propagate to your account and other devices. The sync system built by the Workflow team is able to detect and resolve conflicts for multiple instances of the same workflow, too. My only point of criticism is that because it's automatic, there's no button for manual sync. There are cases in which I'd like the peace of mind of knowing I tapped a sync button to re-sync everything in my account, but that's mostly nitpicking given that automatic sync works well. Workflow Sync has removed a big frustration of mine when using Workflow, as I no longer have to back up workflows manually elsewhere or worry about losing them (although there is a new Get My Workflows action to export a .zip file of all workflows in the app). The other notable change in Workflow 1.3 is Health integration for read and write actions that support all data types stored in Apple's Health. As someone whose lifestyle has been deeply affected by the Health app and as a heavy user of Workflow and automation tools, this is essentially a dream come true – and it shows how the power of automation can go beyond self-celebrating "productivity" and GTD. Workflow 1.3 can read and write Health data. When logging data, you can write health samples in any category that Health supports, as well as save workouts. Health samples include steps, calories, weight, caffeine, respiratory rate, and more; for workouts, you can specify the workout type choosing from a list of built-in activities. For each sample, you have to supply a value with a count or a percentage, and optionally a date. Obviously, you'll have to grant Workflow permission to write to the Health app using the standard iOS Health privacy screen. 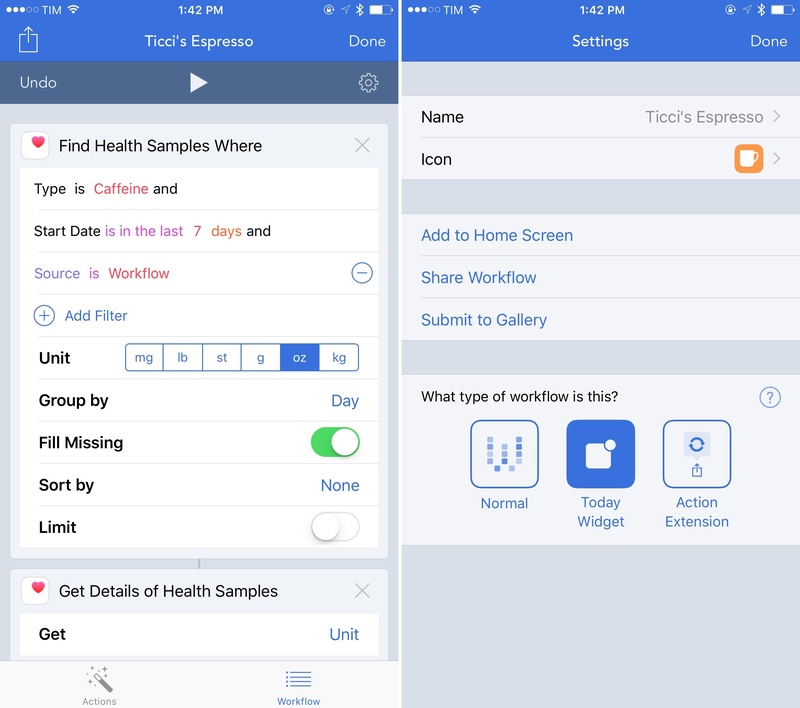 If you're unhappy with apps that write Health data on your behalf or simply want to build a custom Health tracker that you can automate to your taste, you can now do so with Workflow. Personally, I'm considering creating the perfect caffeine tracker for my beloved espresso using Workflow, because I can't find an app on the App Store that fits my needs. I'm even more excited about the ability to read and automate Health data in Workflow and combine the results with actions, custom UIs, and other iOS apps. Then, it's totally up to you. You can read data and perform calculations (such as statistics) on it. You can collect a bunch of samples, sum them up, make a pretty PDF, and send it over email to your doctor, all within Workflow. You can share health samples with extensions, send them to other apps, or build your own logs and charts by integrating Workflow with apps like Numbers and Excel. The idea of pocket computers that can record our health data and an app that lets us automate everything about it sounds incredible to me. When we think of automation on iOS, we tend to refer to things like sharing URLs and launching shortcuts – and that's great, but this is a whole new level of smart automation that puts you in control of important information about you and your lifestyle. 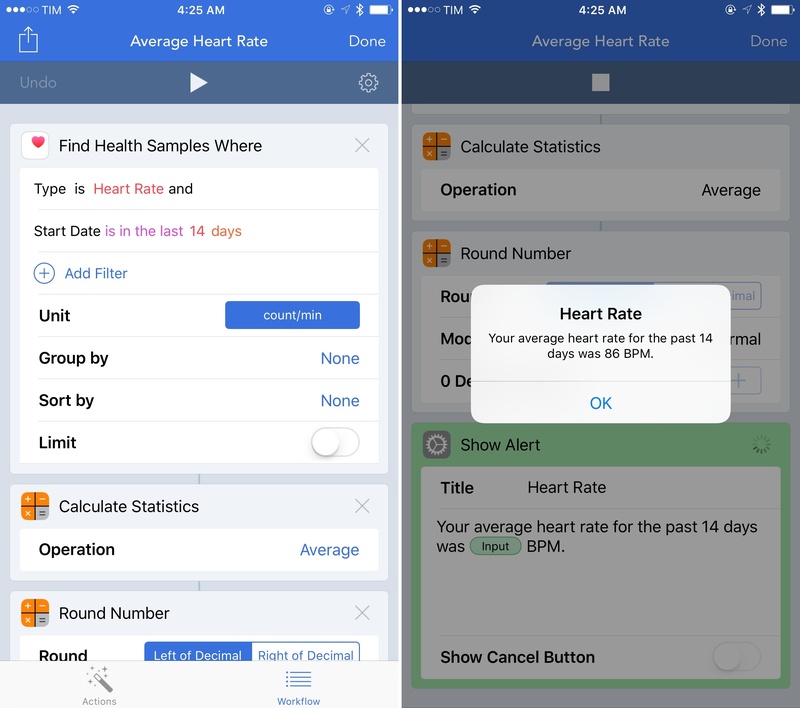 Think about the potential applications for patients who would like to generate a complete report of their vitals as tracked by an iPhone, an Apple Watch, or connected Bluetooth devices: now, with a few taps in Workflow, they can automate the process to save time, be more precise, and ultimately make better decisions about their lives and recorded stats. That's powerful, and this stuff truly matters. To showcase the power of Health actions in Workflow, I created a simple workflow that tells me my average heart rate for the past 14 days as recorded by my Apple Watch. In just four actions, I can access my heart rate data, calculate the average, round the number, and show the result with a message in a custom dialog. To me, this is genius – but I'm used to that when it comes to the people behind Workflow. Workflow 1.3 is another terrific update to an app I'm using every day to make my life better on iOS. Version 1.3 simplifies how workflows can be launched and executed thanks to the widget, it makes it easier to share workflows between devices, and it expands the scope of the app beyond traditional productivity and automation with Health actions. I feel like Workflow never stops surprising me, and I'm glad that version 1.3 continues this trend. Workflow 1.3 will be available today on the App Store.